You’ll need more than five minutes to take in all there is to see at the Georges Braque exhibition (on view through Sept. 22), but exhibition curator Renée Maurer gets you started with a quick virtual tour in the video below. I go to Paris often to visit family, but I’d never been to the Pinacothèque de Paris until recently. What lured me there? 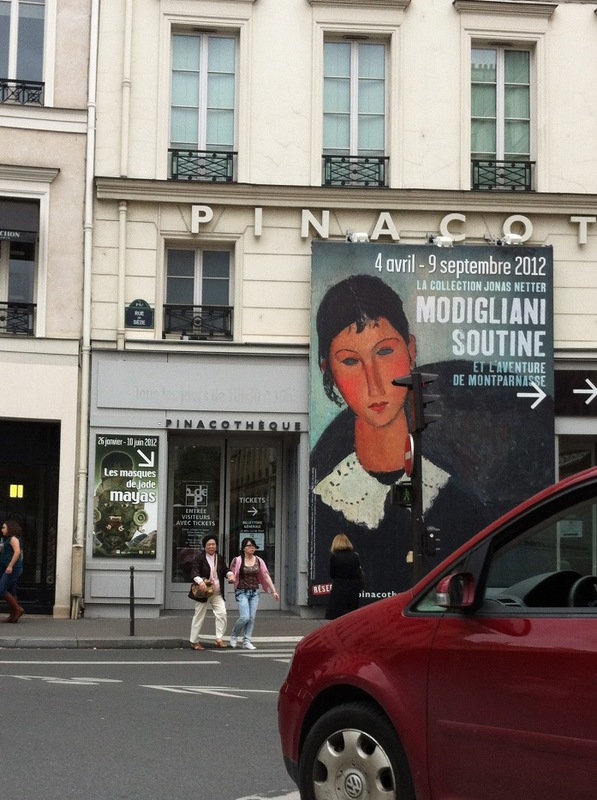 The exhibition Modigliani, Soutine and the Legend of Montparnasse. I’ve had a soft spot for Modigliani ever since the 2005 Phillips exhibition (and I suspect Paul does too). The Pinacothèque’s exhibition features the collection of Jonas Netter, a trademark agent who amassed his collection in Paris in the 1920s. His drawings and paintings by Modigliani blew me away! I also had my first opportunity to see a painting by Modigliani’s partner, Jeanne Hébuterne. While I loved looking at the artwork, what surprised me most during my visit is the way that the Pinacothèque conducts tours. Not surprisingly, the exhibition was crowded–think wall-to-wall people. Entering one of the galleries, I saw a group of about twenty focused on what I presumed to be a tour guide. As an educator, I tend to be one of those people who glom onto tours, so I tried to listen in but didn’t hear anything. That’s when I realized everyone in the group was listening to the guide through a handheld device and headset. I was somewhat disappointed that I couldn’t eavesdrop, but at the same time, this method was a revelation! The galleries were extremely full, and the Pinacothèque’s system provided a tour for those who wanted it, while not disturbing visitors who preferred to look at the art on their own. I spoke with the guide after the tour, and she confirmed that the devices deliver great sound quality. The experience delighted me, especially as we have just started using assistive listening devices in the galleries at the Phillips. While we don’t yet have enough devices for each person on a tour to have his or her own, the system has been very well-received by those who have used it. Personally, I enjoy using it when I’m an a very crowded tour; it eliminates a lot of background noise and focuses me on the guide’s remarks. Henri Matisse, Interior with Egyptian Curtain, 1948. Oil on canvas, 45 3/4 x 35 1/8 in. The Phillips Collection, Washington, D.C. Acquired 1950. When lawyers go on vacation, they likely avoid courthouses. When teachers take a holiday, they don’t tour the local schools. But when museum folks go globe-trotting, well, we just can’t help ourselves. And it was just that inescapable magnetism of an art-filled gallery that caused a serendipitous and delightful run-in, in Paris, between two vacationing Brookes (Brooke Horne of the director’s office and Brooke Rosenblatt of the education department) at the Centre Pompidou last week. Mere footsteps away, another traveling Phillips resident, Matisse’s Interior with Egyptian Curtain (1948), was also there on loan as part of their exhibition, Matisse: Pairs and Sets, which closed on Monday.